Critchley explained that sonar and laser scanning (called LiDAR) have traditionally performed the lion’s share of bathymetric and seabed mapping despite drawbacks because there simply wasn’t a viable alternative…until recently. 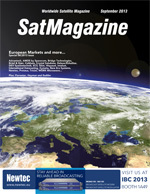 The launch of the eight-band high-resolution WorldView-2 satellite by DigitalGlobe in 2009 ushered in a new era in marine cartography, according to Proteus. 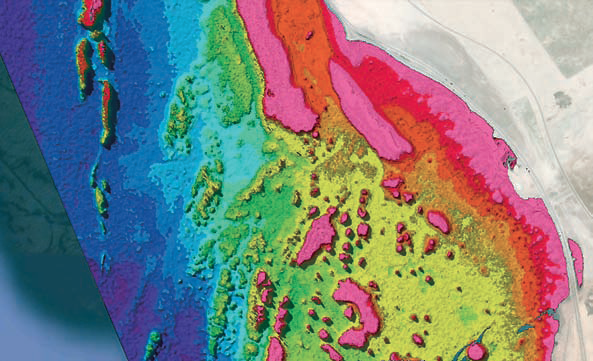 In 2011, Proteus opened its doors and partnered with DigitalGlobe to build a business around accurately mapping water depths and classifying seafloor habitats using multispectral satellite imagery. Based in the United Kingdom and United Arab Emirates, and offering a variety of land mapping services, Proteus also formed a key alliance with EOMAP, a German firm that has developed a proprietary suite of marine mapping tools for the extraction of subsurface information from satellite imagery. After several proof-of-concept projects for commercial clients in the Caribbean and Middle East, the Proteus-led team has won major mapping contracts in Ireland, the Red Sea, Mediterranean, and the Arabian Gulf. Needham has worked in the marine mapping business for 20 years, including stints at the U.K. Hydrography Office and international engineering firm CH2M Hill. She’s watched the evolution of subsea mapping methods as faster, safer and less expensive technologies have emerged. Going back many decades, sonar is probably the most well-known of the traditional technologies. Typically, this involves an echo-sounder or multi-beam system attached to the bottom of a boat or towed behind it in the water. The sound waves generated by these systems yield accurate measurements of water depths up to thousands of meters and the ‘back-scatter’ of the signals differentiates some seafloor cover classes. Not surprisingly, airborne LiDAR began grabbing market share from sonar for some coastal mapping applications when it became widely available about 10 years ago. A LiDAR system is a laser scanner that emits thousands of light pulses per second from the underside of an aircraft. Similar to sonar, LiDAR measures distance to ground surfaces by the time it takes to receive a return signal. While the technique is used primarily for accurate elevation mapping of the ground, the laser signals can penetrate water and provide depth measurements. 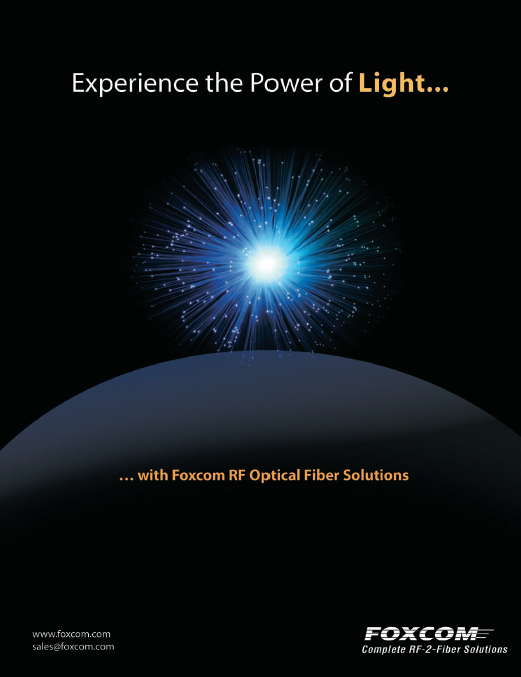 Operationally, satellites offer several advantages. Most importantly is cost, especially for large areas where satellite images can be purchased and processed far more cheaply than a ship or aircraft deployment. Although ground truthing crews may be required for some coastal zone projects, satellite-derived mapping projects generally pose little, if any, danger to the local environment or the personnel involved. Satellites can also cross national borders without permits, covering extremely large geographic areas in a matter of seconds. High resolution bathymetry from WorldView-2, Wexford, in Ireland. “Overall, we calculate that bathymetric mapping and seafloor classification data capture can be performed faster than sonar or LiDAR at a fraction of the cost,” said Needham. She explained that while various marine mapping algorithms have been available for extraction from multispectral satellite imagery for at least 10 years, accuracy and depth limitations hindered commercial competition with sonar and LiDAR. Two technology breakthroughs, however, turned the tide in favor of satellite imagery. The first of these game changers was the launch of DigitalGlobe’s WorldView-2 satellite. Based in Longmont, Colorado, DigitalGlobe expanded its already impressive role in the commercial remote sensing market earlier this year by its combination with GeoEye. The company now has five optical imaging satellites at its disposal: WorldView-1, WorldView-2, GeoEye-1, QuickBird and IKONOS. A third WorldView satellite is slated for launch in fall 2014. 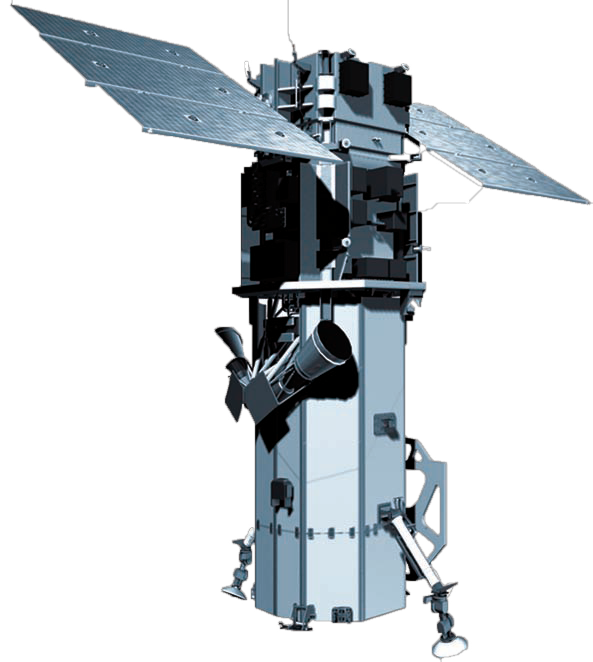 WorldView-2 represents a departure from the multispectral capabilities of other commercial imaging satellites. In addition to its 46 centimeter panchromatic band, the satellite captures eight multispectral bands at 1.85 meter resolution. That’s twice the number of multispectral bands of QuickBird or GeoEye-1. The wavelengths of the additional bands—Coastal Blue, Red-Edge, Visible Yellow and Near Infrared—were carefully selected to maximize feature classification both on land and in the coastal zone. “The additional bands available from the WorldView-2 satellite can help derive a better solution for subsurface applications,” said Needham. The Coastal Blue band has a relatively short wavelength of 400 to 450 nanometers when compared to other technologies. The Coastal Blue band wavelength enables it to travel further into the water column without absorption, resulting in greater vertical accuracy in bathymetric measurements and more detailed seabed classification information. Needham is quick to point out that all of the eight spectral bands are used in the process developed by EOMAP, which represents the second major breakthrough in subsurface mapping derived from satellite imagery. Operations depend on the clarity of the water, however, Proteus has successfully delivered bathymetric data to depths of 30 meters. With turbidity playing a major role in penetration by the spectral bands, the team prefers to use imagery captured on low-wind days when the water is relatively calm with a flat surface. offers two levels of classification services, one using, and one not using, ground truth data. When ground truth data is available, either newly collected or archived, the success of the classification improves. In the clear waters of the Caribbean, Proteus recently delivered 10 seafloor classes to the client. “In some projects such as the one now underway off the coast of Abu Dhabi, we have partnered with an environmental management firm that will send divers into the water to collect ground truth data,” said Critchley. Artistic rendition of DigitalGlobe’s WorldView-2 satellite. 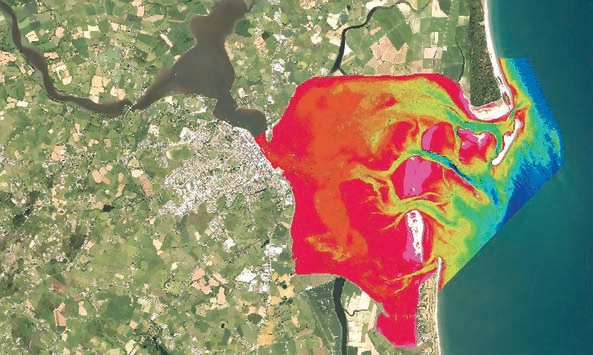 Although the Proteus team is actively engaged in major commercial coastal zones and onshore mapping projects this year, Proteus, EOMAP and DigitalGlobe agree they may only be scratching the surface of what satellite imagery can do in marine applications. Proteus expects the EOMAP algorithms currently being used for seafloor classification and water depth measurements will be further refined to soon provide better and more accurate information. On the satellite side, DigitalGlobe is encouraged by the commercial progress already made by Proteus in the coastal zone applications. After the launch of WorldView-2, the Colorado company sponsored an international contest to find new uses for its eight multispectral bands—DigitalGlobe was overwhelmed with the number of submissions that related to marine applications. The company’s internal laboratories are working on expanding the offshore uses of the data. DigitalGlobe already has WorldView-3 in manufacturing—the satellite will have broader and more detailed imaging capabilities than its immediate predecessor. Plans call for adding eight more short-wave infrared bands and 10 atmospheric correction bands at 3.7 meter spatial resolution. Such will yield an unprecedented amount of visible and invisible data. The pan band will be sharpened to 31 centimeters and the other eight multispectral bands will operate at 1.24 meter resolution. “Within the next few years, we expect to see another enormous leap forward in the capabilities of satellite-derived marine mapping service,” said Critchley. 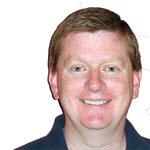 Kevin Corbley is a business consultant in the geospatial profession. He may be reached through www.corbleycommunications.com.